Connects with nearly all Bluetooth tablets, Smartphones, PCs and laptops. 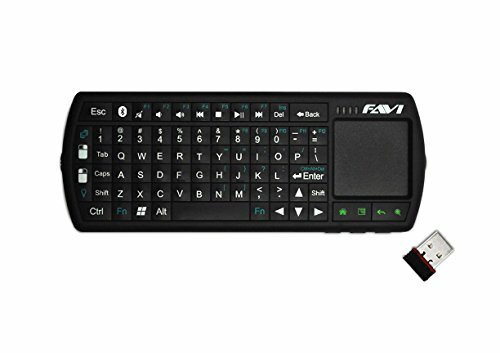 From the dorm room to the boardroom FAVI pocket keyboard is tailored for the modern lifestyle. Take full control of your tablet, ultra book, laptop, or desktop with more speed, accuracy and comfort. US Version (Includes Warranty) - Only products shipped from and sold by authorized resellers such as Amazon.com can ensure that you will be receiving products that have a valid warranty. Type faster and more accurately. Familiar android buttons and FAVI screen swipe touchpad offers fast and fluid tablet navigation. Music / Video hotkeys gives you quick access to your favorite music playlist or video collection. Touchpad features full mouse control as well as "tap to click" and page scroll. Works great for office presentations with its built-in laser pointer and PowerPoint slide buttons. No Bluetooth on your PC or laptop? No problem...a Bluetooth USB receiver is included (stores neatly inside device when not in use). Includes backlit keys for use in the dark.